Divorce can be very expensive. If financial arrangements cannot be agreed costs can easily amount to £15,000 – £20,000 or more each, if the case proceeds to a final hearing and is decided by a Judge. It is easily possible for the cost to be even higher than this. Negotiations between solicitors can be painfully slow. They tend to be by detailed letter. This style of negotiation is hardball. A court process tends to increase stress and negative emotions to the parties. Children get caught between their warring parents. Divorce finance proceedings can also be painfully slow. Clients can easily take a year or more from visiting their solicitor for the first time to obtaining a Decree Absolute and Final Financial Order – whether a clean break or including maintenance. Family mediation does not take place in as many cases as it should do. Many cases which proceed to mediation do not achieve a settlement either. Often parties will not agree to mediate because they don’t trust the other party to reach an agreement. Sometimes there is a small issue which blocks an overall agreement. 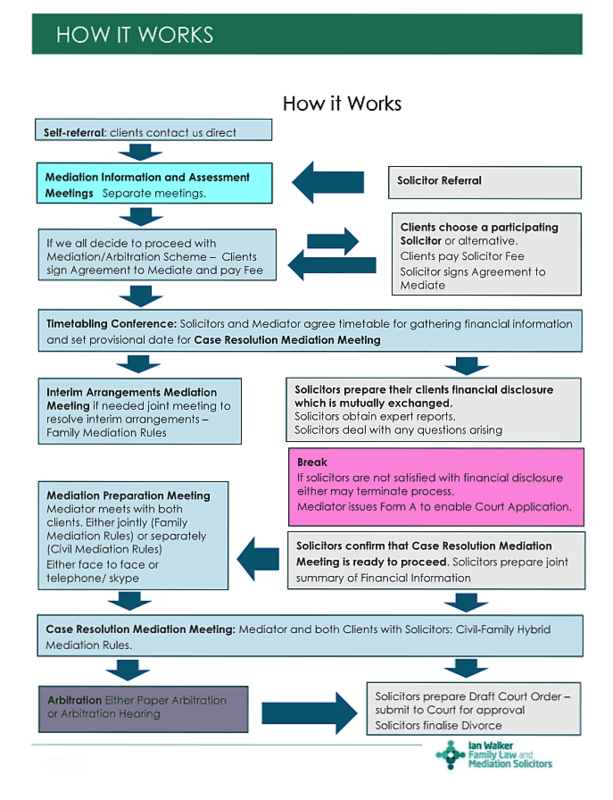 Other times, mediation is undermined by a lack of financial disclosure or by parties receiving very different legal advice as to what constitutes a fair agreement. 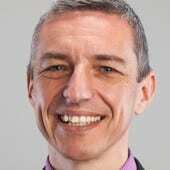 If mediation takes place it, it can save clients thousands of pounds. If it does not succeed, it adds to the delay and to the cost, and the parties end up in court anyway. Ian is one of only a handful of practitioners who are quadruple qualified as a Solicitor/Arbitrator/Family Mediator/Civil Mediator. His knowledge of the pros and cons of the different ways of working of each discipline has enabled us to produce a model combining mediation/arbitration and legal representation in a way which should enable clients to resolve divorce finance issues much quicker and cheaper than a court process. Here is our explanatory Brochure/Agreement to Mediate mediation-arbitration-agreement-to-mediate-25november2016 Full details of the scheme are contained in the brochure. We have reproduced at bottom of this page flowchart showing how the scheme works. Because everyone has a clear role it is possible to undertake most of the work within the scheme on a fixed fee basis. Unless expert evidence/advice is needed, the normal fee will be £3500 plus VAT for the solicitor and £1500 plus VAT for the mediator for the whole process – up to and including the Case Resolution Mediation Meeting – when most cases will settle. If cases do not settle at this stage, the issues should be sufficiently narrow that the outstanding issues can be resolved by an Arbitrator on the basis of the case paperwork. Again, this can be dealt with for a fixed fee for both the solicitor and the arbitrator. It is only in the small number of cases where a formal hearing before an arbitrator is needed in order to achieve a legally binding outcome that it is not possible to offer a fixed fee from the outset. However the case can proceed on hourly rates or fixed fees agreed at that stage. Even in this scenario, we believe that the overall costs per person will be considerably lower than a comparable court process. Unless there is a delay caused by obtaining expert advice and or pension information, most cases should be able to be resolved within a six-month timescale – if not much shorter. All cases should be resolved much quicker than contested court proceedings. Saving time, mean saving costs and saving stress and also means that family members can take their lives off of hold, and move forward positively. We have also sought to retain for clients the most significant benefits family mediation. These are working together, and reaching agreement together. There is also much to be gained working with a couple – whether together or separately, to assist them to find better ways to communicate. Our mediation-arbitration programme is more expensive than traditional family mediation. However the advantage of our mediation-arbitration scheme is that there is a much much greater level of certainty that a definite solution can be achieved for the couple. A broken mediation simply causes delay and extra cost. In our scheme, if the mediation fails, the case move seamlessly onto a decision by arbitration. The scheme also involves the couple solicitors throughout – which will give each of the couple much greater confidence in the agreements that will be reached. To make the scheme work requires teamwork. Our arbitrators are Karin Walker who is a member of the National Committee of Resolution, and the Chair of the Resolution Dispute Resolution Committee; Rhys Taylor who is a barrister based at 36 Bedford Row Chambers, London; Ian Taylor who is a solicitor who sits part-time as a Deputy District Judge and Barbara Corbett, a solicitor based in Jersey who is very familiar with international issues. The solicitors who have agreed to provide legal advice within the fixed fees of the scheme are all experienced practitioners including several who are also mediators. We all have confidence that we can work together to give our clients a much better and certain journey through their divorce than they might otherwise have.